Product #20454 | SKU SKB-D2022 | 0.0 (no ratings yet) Thanks for your rating! 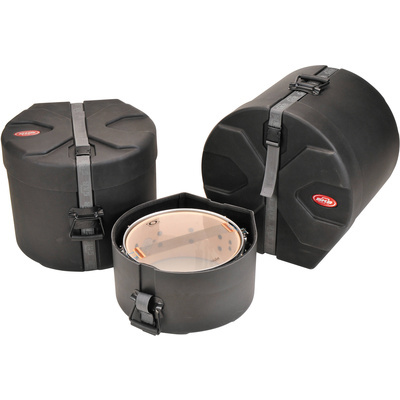 The black 20 x 22" Bass Drum Case from SKB is a tough-minded, durable case for your valuable drum. It's manufactured to accommodate one drum within its rotationally molded polyethylene frame and protect your instrument both inside and outside. The exterior is a hard shell, D-shaped design and accented with SKB's Roto-X molded pattern that allows you to stack similar cases. The inside is padded to be extra gentle on your drum. The case comes with pedestal feet that maintain stability when it's placed on the floor. Closing the case is achieved via the heavy-duty, wraparound web strap that contains a high-tension slide release buckle to provide rapid access to the interior. Rotational molding is a 3-stage heating process that results in evenness all around the edges of the case. The polyethylene material is inserted into a mold, and then gradually rotated until the material sticks to the edges of the mold in an even pattern. Once cooled, this plastic material forms a strong bond that minimizes sagging and potential collapse. This case is manufactured to such high standards that it comes with a lifetime warranty against manufacturer's defects.